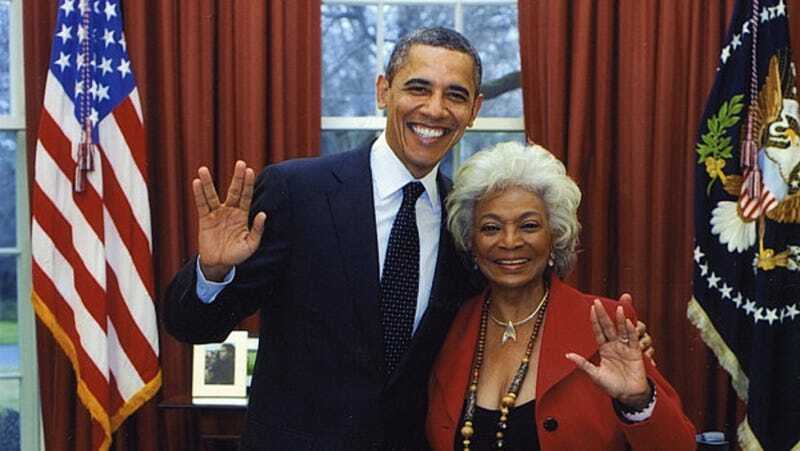 Here is President Obama flashing the Vulcan salute during a visit from Nichelle Nichols, Star Trek's Lieutenant Uhura. She went to the Oval Office back in February but didn't tweet out the photo until today. This must have been a dream come true for the president, who is an admitted fan of Star Trek and confessed to Nichols that he had a crush on her character when he was a child. If it wasn't already clear, this photo officially puts Obama on the nerd side of the great Nerd vs. Jocks debate.